Image of proposed change to house - Westcombe house. The proposal is for a single storey rear extension on an old school house that is now a residence for a growing family. The building is essentially a single long block with an open roof interior that has exposed rafters and a lofty light character, which the clients wish to continue into a new extension. The owners wish to extend to the rear to facilitate home working and family/social gatherings. The proposal is to extend the rear of the block across the back garden. The design of the extension is simply a continuation of what exists at the rear of the schoolhouse. The roof will be continued at 90 degrees across what is presently a disused back garden. This will require the demolition of the existing, but dilapidated rear conservatory that is not in a good state of repair. The interior will also be a continuation of the rafters and open ceiling. At the end of the extension it is proposed that a low ceilinged unit is to be built that houses a utility room and W.C./cloak room. Presently there are two entrances, one at the front of the house that enters the master bedroom and the other in the middle of the house that enters the living room. It is proposed that the middle entrance is blocked off and a matching window is installed. It is also proposed that the existing entrance area is converted into a storage area and W.C./shower-room. The back garden area is to have a 2.2m high feature wall of brick that will form a backdrop to the views out from the proposed wide almost full length glazed opening. This glazed opening will have folding glass doors supported from a box beam that will be set into the ground and walls. It may be necessary to provide a steel column to help support this beam. In which case the column will be a grey painted circular column. In order to minimise any bulk of the extension, it is proposed that the extension be hipped at both sides. In this way the extension is lower than if it had gable ends. The extension also sits within the boundary. Therefore there will be no interference with the existing boundary wall. Internally this doesn’t affect the continuous counter and drawing room and kitchen units – due to the fact that the existing walls are so thick and that the units and counter can be built so as to create an integrated side wall. It is proposed that a new entrance is created in the extension on the side that faces the front garden. From here there is access into the living room and kitchen area. Adjacent to this entrance there is the W.C./cloak room and utility room. From the kitchen, which is within the extension one accesses the dining room and drawing room within the existing open part of the house. This area then leads onto the bedrooms, one of which, the master bedroom has a door that leads to the front. The existing ramp and steps that access the current front door on the side will be removed and the surface made to be part of a continuous and level “mews” like surface of cobble or brick stable sets. The proposed extension is to be built in materials that match the existing materials, including; the brickwork, the new window that replaces the middle side door, the slates, the gutters, rainwater pipes and fascia's, the timber rafters and their fixings and the ridge tiles etc. The glazed folding doors will be made of grey painted aluminium frames of a minimal thickness to create a “lighter” character of glass façade. The municipal scale and character of this old school house and council depot present this dwelling as a robust home of almost warehouse proportions. The extension maintains the simple strength of simplicity by not complicating the arrangement. The proposal extends a large 6.5m into the disused garden – but this allows the stately character of this impressive space and building to have continuity and to still function visually and spatially as one continuous whole block. Therefore the character of this block is maintained and uninterrupted with the addition of a spacious, light filled and lofty space for harmonious and generous household living. As a less architectural point and more human aspect, Mr Stokes, the client who is presently undergoing treatment for cancer also requires this space as a practical necessity for working from home and recuperation. 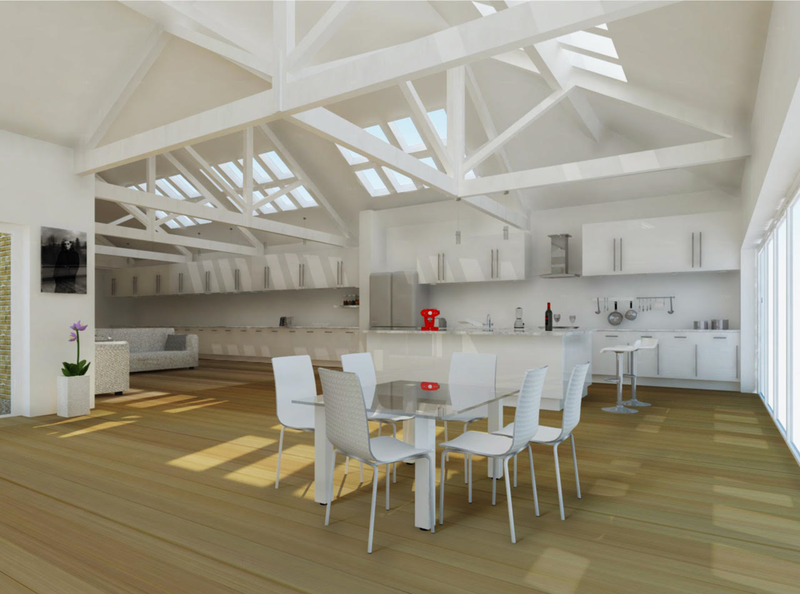 Westcombe House - Proposed interior kitchen & living space view.